Mobile apps for cyclists can have a range of uses–from allowing users to locate bike share stations to providing information in case of injury. Photo by davebloggs007/Flickr. With the growing number of smart phone users and urban cyclists, the rise of mobile apps for bikers should come as no surprise. These innovations can be used in myriad ways—from navigating maps to submitting pictures of local potholes in need of repair. Along with bike lanes and other forms of road infrastructure, user-friendly mobile apps are not only encouraging more people to pick up a bike, but are also creating a safer environment for cyclists on the road. Bike share schemes have grown exponentially since the very first debut in Amsterdam in 1965. The largest—in Hangzhou, China—offers 50,000 bicycles at 2,000 locations. Adding to their appeal, Hangzhou’s bikes offer a free 90 minutes if the user has also purchased bus fare. Many of these hugely popular bike share systems are now accompanied by mobile apps to up their convenience game. EcoBici in Mexico City, for example, has its own app that displays bike stations as well as the number of available bikes on an interactive map. Spotcycle’s Reality+ feature. Photo by Spotcycle. Some bike shares, like Capital Bikeshare in Washington, DC, operate with Spotcycle—a free mobile app that locates stations, posts the number of available bikes, and provides a navigation system for determining routes from one station to another. 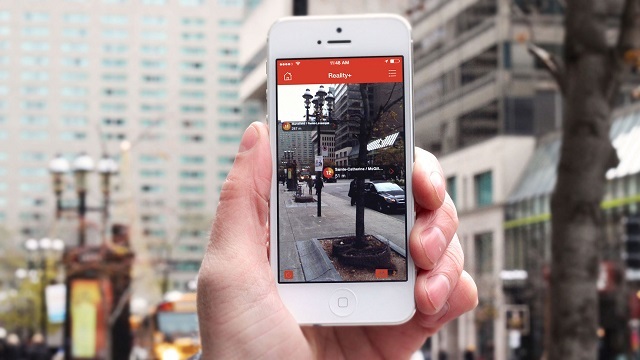 Taking it a step further, Spotcycle now offers a new feature called Reality+, which is an augmented reality overlay that is used to locate nearby bike stations in live view, making bike shares systems even more accessible. Spotcycle has recently expanded to support Abu Dabhi’s ADBC bike share program—a move that will likely encourage growth and awareness in a region where bike shares have yet to make an appearance. In the past few years, developers have started to look beyond bike share to those proud urban owners of personal bikes. Apps that allow riders to connect through activity tracking and challenges can foster a stronger community of cyclists. Some of these apps provide a platform to challenge friends and share saved routes and traffic information. For example, Spinlister is a rental system that allows users to find bikes to rent from fellow cyclists in the area. They call themselves a “global bike share,” users can find a bike to ride in almost any corner of the world—particularly helpful when traveling! In addition to route tracking, apps like Map My Ride offer a community, with news feeds to post updates. Map My Ride has a network of more than 30 million users who connect with one another and share their accomplishments. There is often great need for raising awareness and educating the public about urban cycling. Recognizing this, Bike Doctor offers technical information about bike maintenance so that riders can perform on-the-spot maintenance. Similarly, Size My Bike allows users to input individual body measurements, generating recommendations for bike sizes. St John Ambulance’s First Aid for Cyclists app gives users information about how to car for themselves in case of an accident. Screenshot by user. 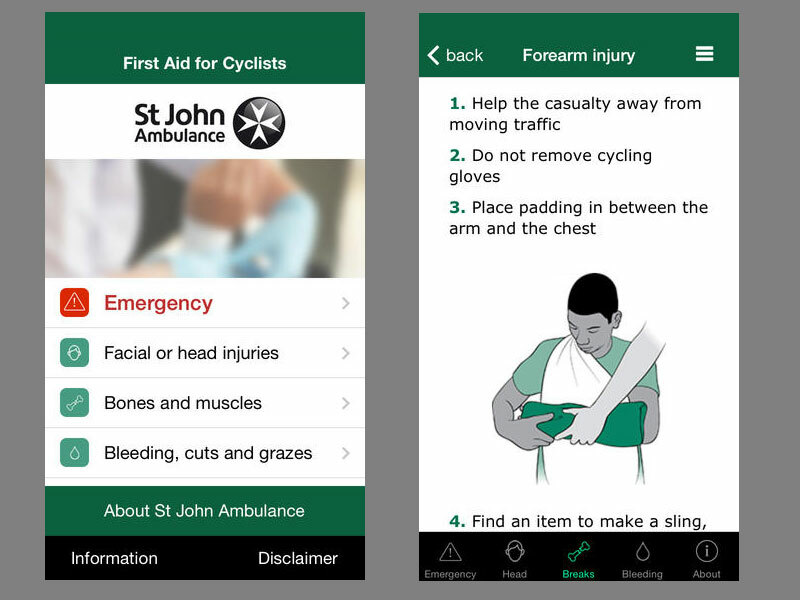 Another useful app is St. John Ambulance’s First Aid for Cyclists, which provides first aid information and self-care techniques specific to cycling-related injuries. Apps such as these are particularly useful where the biking community is still growing and available bike shops or resources may not be available. Use a great cycling app that didn’t make our list? Share in the comments section below!